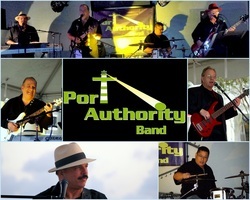 PORT AUTHORITY Band Charleston's FINEST Special Events & PARTY Band! What do you get when you put a handful of amazing musicians together to create ONE phenomenal group? You get PORT AUTHORITY, the sensational band that rises musically above your every expectation. PORT AUTHORITY captivates its audiences with a fresh, diverse repertoire of songs you will not hear performed by other bands in SC or elsewhere! PORT AUTHORITY is the hottest PARTY Band with an incredible sound MUCH greater than its size! If you are seeking an all-inclusive show featuring the most popular Timeless TOP 40 songs of… Rock & Roll, Funk, Motown, Shag, 60s, 70s… AND amazing original songs… then you won’t want to miss this incredible group perform live! This band raises the bar on musicianship and professionalism to a new standard in the Low-country.